So we’re still reeling after having the best #ECMeetUp 2017 this side of the century! 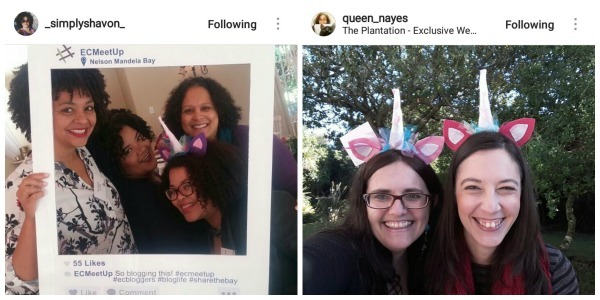 Yes, I am still pregnant – even though going into labor at a blogger conference would probably have made the event go viral (hello Facebook Live). But nope, my kid is still happily tucked away in moms tummy. He enjoyed all the amazing food that Ralph and Sarah, of The Plantation, fed our faces with. Uh can you say decadent pancakes (with just about every topping!) and a breakfast that made me feel as if I should have a title infront of my name (Lady Lu sounds good, right?) We were also blown away by the amazing sponsors – like, totally blown away… like so blown away that we have some to give to you too! 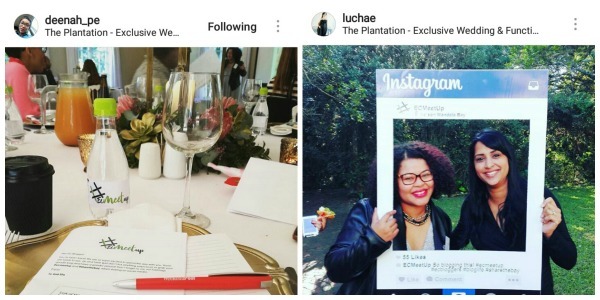 But first, a ECMeetUp recap: As always, the event was made complete by the attendance of all the (uber friendly) Eastern Cape bloggers. Since our inception in 2016, we’ve upped our numbers by a whole lot (I’m pregnant, don’t ask me how many), and I am so excited that the blogging industry is growing on our side of Africa. 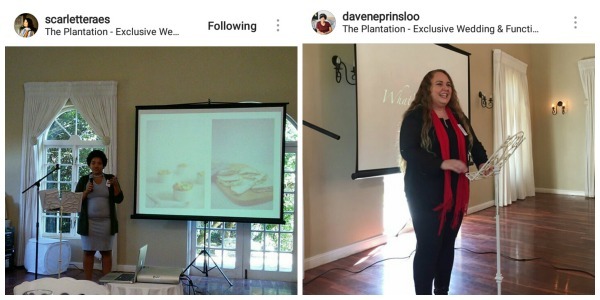 Our guest speakers, Davene Prinsloo and Mandy-Lee Miller, blew my mind. I learnt so much and felt so inspired to take my blog more seriously! We totally enjoyed spending time with Mandy! How awesome was Nelson Mandela Bay Tourism for flying her down and hooking up her accommodation and itinerary while she was in the bay?! They are the real deal, yo! We were totally spoiled by all our very own ‘Proudly PE’ brands who spent some time with us. Dockside Brewery’s designed a special craft beer for our bloggers and Mastertons – our fave, local coffee and tea specialists – did the same, by brewing a special #ECMeetUp coffee just for us! We were so chuffed to have other brands, such as Rain Africa, there who mixed special concoctions for us. Just the word “concoction” makes me excited. Concoction. I love it. Ella will be chatting more about the meet up in a Youtube video over here. Afroventures, who gave five delegates a voucher to tour our amazing bay. Beauty with a Difference Spa, spoiled our three helpers (they needed to be thanked since I was pretty much out of action and left our Ella to do most of the running around). Big5 Comedy surprised a few of our bloggers with (not even officially released yet!) tickets to the new Big5 Comedy show. Bonamia Restaurant, one of the bay’s best restaurants, gave meal vouchers. Cadbury PS is giving away cash prizes to the value of R2500! Winners will be anounced this Friday. Christian Art Media, one of our biggest supporters, gave hampers to two lucky bloggers. 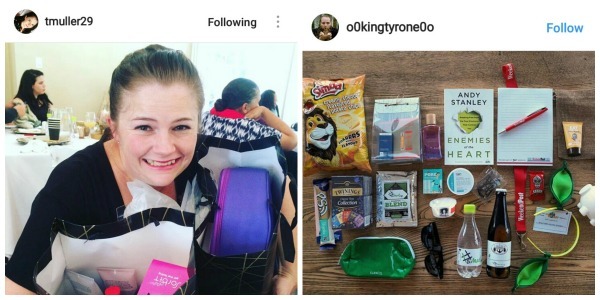 Clicks South Africa, always a fave, selected two Instagrammers who went home with a hamper each to the value of R2500! Conscious Confidence by Abigail K totally blessed someone with a voucher for a conscious confidence session. Essence Beauty gave two beauty hampers. Faithful to Nature also gave a rad hamper. Gum Tree made Ella and I green with envy when they surprised two delegates with a Nespresso machine each! I know right! Herald (the newspaper house that Ella and I work for) also gave two hampers. Kuzuko Lodge surprised a lucky couple with a stay at their beautiful lodge. Mcgregor Country Getaways also ran an online competition for a stay at their amazing lodge. MLM – Mandy totally made someones day by giving away a consult session. 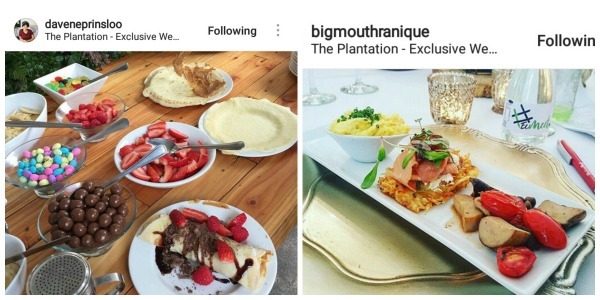 Nelson Mandela Bay Tourism, as if they hadn’t already done enough, gave two bloggers full passes to all the touristy things the bay has to offer. Plantation, our venue, selected one delegate to win a stay at their newly renovated guest house. Radisson Blu gave away a stay at their beautiful hotel in Summerstrand. Ruby Rose (who designed our blog and meet up logos) gave one blogger a logo voucher. Shammah on the Valley gave a stay at their guesthouse. Tech in Focus knows how to talk our language and gave five bloggers 16gb flash drives. Tyranny of Pink gave a newbie blogger a free consult session. Watercolor Heart gave a voucher. Woolworths Beauty Walmer Park spoiled two bloggers with beauty hampers. Zaahida Joel Marketing gave three blog consult sessions. Zando gave an amazing beauty box filled with goodies. And now for the giveaway! (And the crowd says: finally!) I have an #ECMeetUp hamper, filled with some of my fave meet up treats, to give to one of you, to say THANK YOU for reading! You reading my blog, makes me a blogger – innit? Well, it certainly does help to make me feel like I’m not just over here typing things that mean nothing to no one. Thank you, I appreciate you! I want to keep this nice and easy. To enter, simply comment below, letting me know which of my social media platforms you follow my blog on. In case you didn’t know, I’m over on Facebook, Twitter and Instagram. Winner announced Friday, May 26th. BTW thank you to all the amazing bloggers who shared their pics on Instagram. Check out some of their names on top and give them a follow! Was very well put together. Thanks for all your efforts. The food looks awesome! I follow you on Facebook ! I love reading your posts! You have great talent in writing! Thank you Andy 🙂 And congrats on winning the prize! Wow, everything looks so divine. Twitter is where it is at for me. I follow you on Facebook, Twitter and Instagram…I am your stalker . Love your blog, your pictures , your heartwarming updates about your pregnancy , your adorable kids. Wether I win or not, you are a truly a special and amazing person and your love for the Lord is what I truly admire about you. Stay Blessed. I follow you on Facebook, Instagram and recently Twitter. I also subscribe to your blog. I follow you on facebook.love your blog .met you with a visit at word of faith .you are bery inspiring and you keep it real . Yay!!!! I am sooooooo delayed!!!! I have just seen I am the winner of the giveaway!!! Thank you Luchae!!!! I am super excited!!!! A great start to my weekend !